While many objectively measurable parameters exist to determine mattress quality—heat transfer index, hygiene, long-term stability, motion transfer index, pressure distribution and more—a purely subjective parameter is typically the most important factor when choosing a new mattress: comfort level. For most people, that is intrinsically linked to mattress firmness. How soft or firm a mattress is often a deal breaker, just as much as its price. Many brands offer their own comfort scales and numbered firmness ratings as a way to categorize their mattress products, such as Saatva and its pricier sub-brand Loom & Leaf. A few companies, such as Casper and Leesa, advertise an adaptive and universally comfortable design that is supposed to suit anyone regardless of firmness preference. Realistically, though, three firmness levels can be defined by these overall descriptors: soft, medium, and firm. Whatever the case may be, the best way to find out if a mattress suits you is obviously to try it out yourself. It is important to note that mattress firmness is not the same as the level of support it can provide. Firmness is all about the initial feeling that you get from the top layers of a bed. Long-term support, on the other hand, has more to do with the core and lower layers of your mattress. This means that a firm bed is not your only option if you suffer from back pain, no matter what your doctor or chiropractor says; in fact, a 2003 study shows that using a mattress of medium firmness is likely to be better for you. Instead of discussing arbitrary and subjective descriptors of firmness, below are some questions designed to help you choose a mattress firmness to suit your lifestyle and sleep style. Do You Share Your Bed with Anyone? It sounds like a very personal question, but it’s actually very important. Because each person’s comfort level is different, more often than not you will find that you and your partner may have different preferences. If this is the case, there are three solutions: buy two twin mattresses and push them together to simulate a connected, bigger bed; buy an air mattress with separately adjustable sides, so you can each enjoy your ideal mattress firmness; or get a mattress that you both agree is of medium firmness. Not only is the latter the least expensive and one of the most commonly preferred and commercially available options, but it’s also the objective middle ground. This may be the key consideration in choosing how soft or firm your mattress should be. Typically, comfort level with this in mind is instinctive, but sometimes having a guide like this helps. Generally, the higher you place on the Body Mass Index (BMI) scale, the firmer your mattress needs to be. A person with a below average BMI will likely be more comfortable with a soft or medium mattress, because firmer options may feel too hard—almost like sleeping on the floor or solid ground. Conversely, heavier people may actually need that firmness, in addition to more support and a thicker mattress overall. A person with an above average BMI may sink too low into softer mattresses, which can result in two things: more heat transfer and more difficulty getting out of bed—particularly if a person already has mobility or flexibility issues. There are four kinds of sleepers: side sleepers, stomach sleepers, back sleepers and people who sleep in multiple positions. For the latter, the immediate recommendation is a mattress of medium firmness, because of the reasoning already mentioned above: it’s the objective middle ground. A side sleeper usually benefits from a softer mattress, as it contour to the irregular shape of the position more, and lessens the amount of pressure on the side of the body supporting the person’s whole weight—particularly the arm underneath that can go numb with lack of circulation with firmer mattresses. A stomach sleeper needs a firmer mattress, because their midsection—meaning the hips and pelvis area—are supporting most of their body weight. A soft mattress may not provide enough resistance to balance out that distribution, and that may create unneeded pressure on the spine. Finally, the back sleeper—the gold standard, as it were—distributes body weight in the most even way during sleep, which is why any mattress firmness will do. Wondering What to Make of Conflicting Suggestions? Although the recommendations here that fit your sleep style may differ from suggestions already made for your body type above, it’s worth noting that this set of questions is meant to help you properly decide what is uniquely right for you. Here’s a final pro tip: There is also the very real option of customizing the firmness of the top layer of your bed. You can use mattress toppers! This is why, if faced with two very good contenders, you should always choose the firmer mattress. 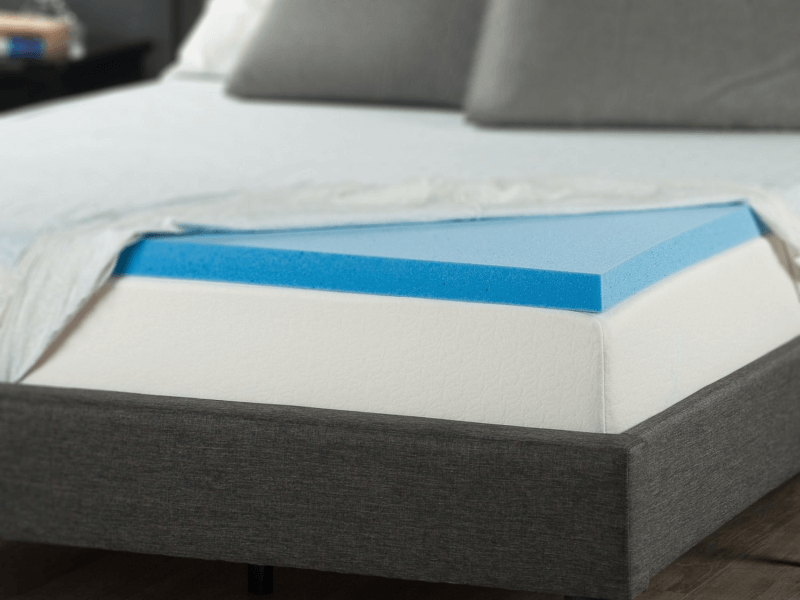 For instance, if you find that a even a medium level of firmness is uncomfortable for you as a stomach sleeper, you can always add a plush mattress topper to ease the initial feel of the bed without giving up the support you need.